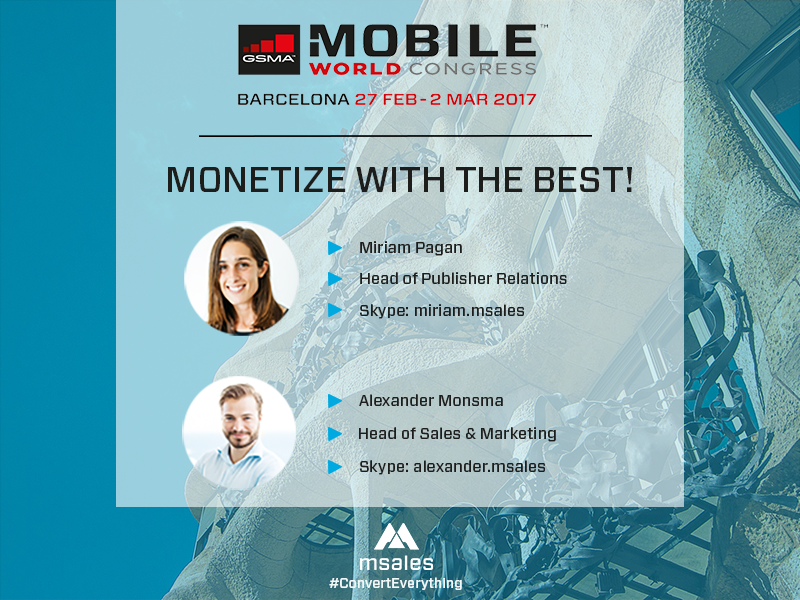 The worlds’ largest gathering for the mobile industry, Mobile World Congress 2017, is taking place in the largest metropolitan city on the Mediterranean coast, Barcelona between 27 February and 2 March 2017. This enchanting city is steeped in history and attracts millions of tourists each year with its’ exquisite beaches, world renowned architecture and some of the most delicious food and wine offerings! You could not ask for a better setting than Barcelona to bring together the mobile industrys’ top thought leaders and innovators to discuss the latest developments and share ideas. msales will be making a debut appearance at the Mobile World Congress this year in Hall 8.1 – App Planet Stand 8.1K79 and promises to bring its’ familiar eclectic mix of chivalrous relationship building and world-renowned, tech-driven monetization solutions to the table. Our managed supply and demand platform connects app developers with their desired inventory anywhere in the world. We work with digital entertainment products from lifestyle to commerce to gaming and more on a performance basis, offering flexible, quality user acquisition at scale through our plug and play system. Click the button below to arrange a meeting.